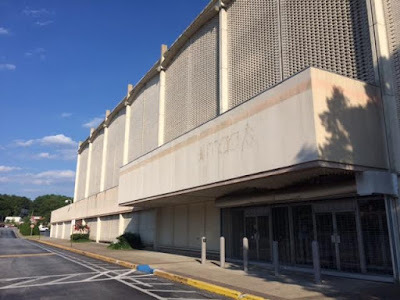 According to Decaturish, the Costco store at North DeKalb Mall is approaching initial site work . Readers of both ToNeTo Atlanta and Decaturish reached out Friday with news that they had received a flyer in the mail of a "community [rezoning] meeting" regarding a proposed rezoning of the North DeKalb Mall property. The meeting, planned for Thursday April 26, will take place in the former ROSS Dress For Less in the mall and will last from 7 to 8 pm. 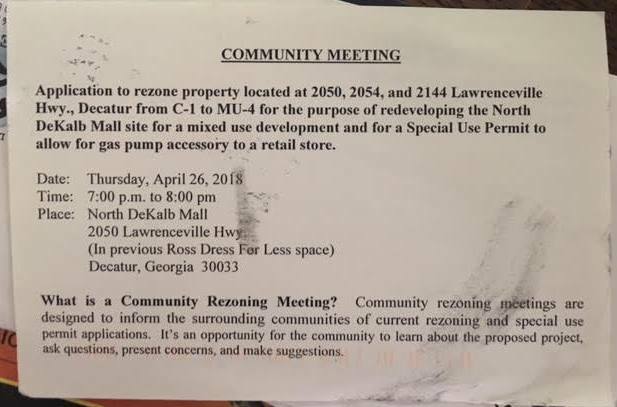 The proposal seeks to rezone property at 2050, 2054, 2144 Lawrenceville Highway from C-1 (Local Commercial) to MU-4 (Mixed Use High Density) for the purpose of redeveloping the North DeKalb Mall site for a mixed use development and for a Special Land Use Permit (SLUP) to allow for gas pump accessory to retail store. The purpose of the meeting is to "inform the surrounding communities of current rezoning and special [land] use applications. It's an opportunity for the community to learn about the proposed project, and ask questions, present concerns and make suggestions." Kathryn M. Zickert, a partner in, and the leader of, the Zoning, Planning and Land Use Practice Group of Smith, Gambrell & Russell, LLP, and attorney for mall owner Sterling Organization, confirmed to Decaturish that the rezoning and gas SLUP relates to a Costco store. According to Zickert, the Costco store could open in 2020, at the earliest, but it might open as late as 2021. Despite widespread industry fears of "the Amazon effect" and new ecommerce grocery businesses like Jet (now owned by Walmart) and Boxed (referred to as "Costco for Millennials,"), Costco's commitment to building in North DeKalb is a testament to their faith not only in their business but the community, too. Last June, a well-placed source told Decaturish that Costco was planning for a March 2020 opening. According to Zickert, the redevelopment would be mixed-use and include 450 multifamily units – apartments and possibly town homes – and a 152 room hotel. There would also be additional restaurant and retail space. She said at least two existing tenants – the AMC movie theater and the Burlington Coat Factory – will continue their leases at the space during the redevelopment. ToNeTo Atlanta has heard numerous times from various sources that Marshalls and AMC Theatres plan to maintain their presence at the property indefinitely. Due to the project’s size, it will have to be vetted as a Development of Regional Impact by the Atlanta Regional Commission (ARC). There has been talk of a Costco store opening at North DeKalb Mall since at least 2008. In the decade since then, the mall has continued to lose tenants including Chick-fil-A, Applebee's, Rack Room Shoes, ROSS Dress For Less, Play it Again Sports, Bath & Body Works, Wendy's and Macy's. Marshalls (2010) and Dollar Tree (2013) may be the last national retailers to have opened in the mall. Despite the closures in the mall, a number of new business have opened and in some cases reopened outside the mall. Both Checkers and Exxon reopened previously closed locations on North Druid Hills Road in front of the mall, while Zaxby's, Golden Corral and Goodwill store, donation center & offices all opened around the mall. Originally constructed in 1965 and anchored by a Rich's department store, the mall is currently occupied mostly by local businesses with short-term leases. When Sterling Organization bought the mall in 2014, it said its plans were to transform the 622,297 square foot space into an open-air mall concept. The idea, the act of "de-malling" has been a popular trend in commercial real estate. A similar transformation took place in Asheville, NC, where the former Biltmore Square Mall was reborn as Asheville Outlets. The largely vacant indoor mall was stripped of most of its inline retail and replaced with new outdoor outlets with the exception of an existing former Dillard's turned outlet that remained, and serves as one of the center's anchors. An enclosed "food pavilion" also opened in place of the mall's former food court. According to DeKalb County property records, Sterling paid $15.5 million for most of North DeKalb Mall in 2014 and paid an additional $10 million to purchase the two level Macy’s store and accompanying auto center space in 2015. As we reported earlier this week, Arrowhead Investors, LLC is seeking the rezoning of a total of 13 acres near North DeKalb Mall for the construction of over 100 single-family and town home units. The same firm previously laid the groundwork for a smaller development across from the QuikTrip on the back side of North DeKalb Mall. That project, today known as Towns at North Decatur, is a 41 unit, three-story town home community currently under construction, with units starting in the $400,000s according to the property's website. While Decatur area residents may have to wait at least a couple more years for their Costco to open, a new Costco in Woodstock near The Outlet Shoppes at Atlanta is expected to open August 10. 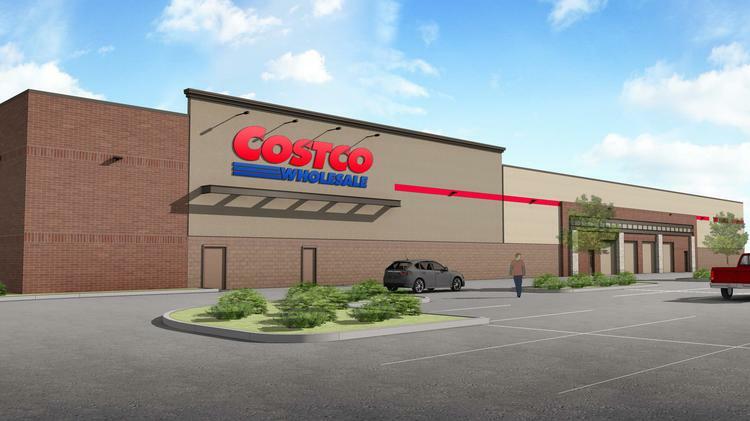 Are you excited by the prospect of a Costco at North DeKalb Mall? Do you think the addition of a hotel and residential units on the mall property makes sense? What types of retailers or restaurants would you like to see open as part of the mixed-use redevelopment? Oh please let it be true! That will always be the "former Rich's" to most of us, no matter that Macy's finally put their name on it. What else would we like to see here? Maggiano's? Cheesecake Factory? Some kind of popular chain restaurant like that. Something way more upscale than the Golden Corral. And while I'm dreaming, TRADER JOE'S!!! About time the area gets a Costco. Asking what we types of retailers and restaurants we want on the site is a waste of time. We get what they give us. How many kids does DCSS think it can stack up in schools before it builds more? Where does DeKalb plan to get the sewer capacity necessary to handle all the new homes and restaurants? And when do we get mass transit — and I don’t mean more slowpoke buses. 5 years = the closure of the new Costco. Reason = crime and low sales. Enjoy it while you can! Crime and low sales? Umm...Ok! So many apartments, so little resources. They are getting rich by exploiting Decatur while the residents pay the ultimate price of having our homes rendered unlivable due to over-development and over crowding of this area. The density is outrageous and there's no way it's sustainable long term. Have a look at the areas of Gwinnett that boomed in the 90s, now standing empty. Same thing. @April 15, 2018 at 6:21 PM - what are you talking about? Cumberland has always been a good area. Its next to Vinnings, Home depot HQ, Racetrac HQ and minutes away from Buckhead/Governor's mansion. Beautiful area. Low crime. Multiple offices including the Weather channel. This all existed before the new Braves stadium. Not to mention very expensive homes/condominiums/townhomes. The mall had its ups and downs but nothing like the North DeKalb Mall. That mall is in a heavy crime area. Lower income. Sam's club would possibly do well but Costco is more expensive. So lower than expected sales will close that store. Along with shopping carts disappearing and crime. They would have to invest in extra police. I think this Costco will do just fine. It'll be very accessible to Decatur area residents, people along 78 out toward Stone Mountain, and not to stereotype too much, but Indians love Costco, and there's a large Indian community nearby. I do tend to wonder if Brookhaven will remain the main Kosher Costco, or this one (which is closer to Toco) will become the main Kosher Costco. I'm guessing the former since the cost to kashrut the kitchen has already been done for Brookhaven, no major need to do it for this new Costco. When are these developers going to get a transportation plan in place for the already horrible traffic on Druid Hills and Ponce. If they add more apartments, the area is going to be gridlocked worse than it already is. Unsustainable!! uh....the developers are never going to put in a transportation plan for the area right-of-ways. That is public property and is the job of the government. But if you are depending on DeKalb County to do anything innovative, forward thinking and worthwhile, you might as well go searching for Big Foot. You'll have better odds. LOL @ transportation plan / ATL The entire ATL metro (along with many other major cities in the US) has jumped the shark with public transportation. It's DEAD, stop whining about it. The only way you can get people to use public transportation is to pay them to use it AND make it so easy it picks up up AT home, drops you off AT work, AND runs all your errands for you! MOVE ON! ... and LQQK at me when your sitting beside me gridlock traffic in my $$$ Benz and don't hate! PS That Costco won't make it IF it is even built out!